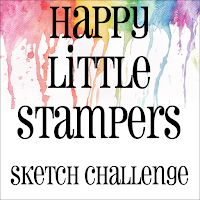 I went in a totally new different direction for me with this sketch--no stamps! While I was thinking about this sketch, I saw a couple of videos on the Daily Marker blog. My head was spinning with ideas for lines and eyelashes. Without looking at the sketch a second time, I started drawing lines and coloring shapes with my Copic markers. I drew all the vertical lines first, varying the space between lines. Then I drew horizontal lines connecting the vertical lines at random intervals. After all the lines were drawn, I started coloring, just eyeballing where the colors should go. The only rule I tried to follow was that adjacent spaces should not have the same color. After all my coloring was done, I drew in the tiny eyelash lines. This is the first card I made using Kathy's line techniques as inspiration, but it is the second card I have posted. 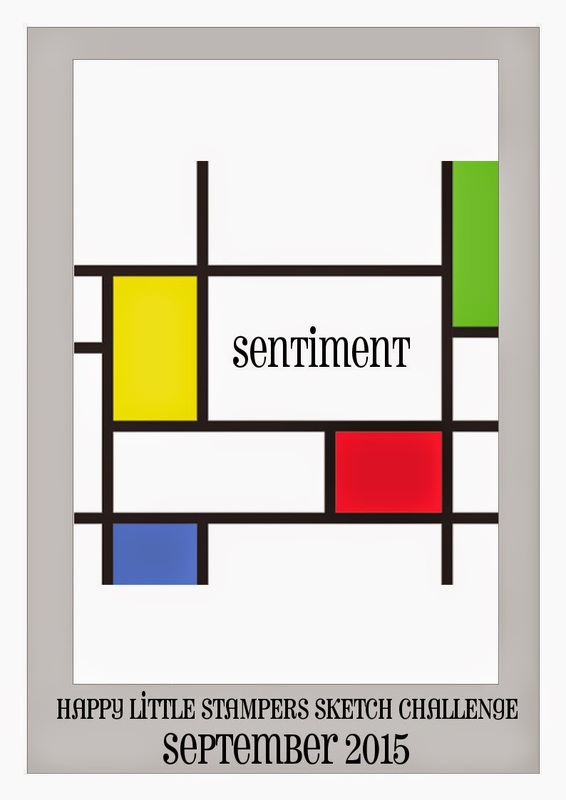 Please click here to see the second card I made using this technique and posted a few weeks ago. 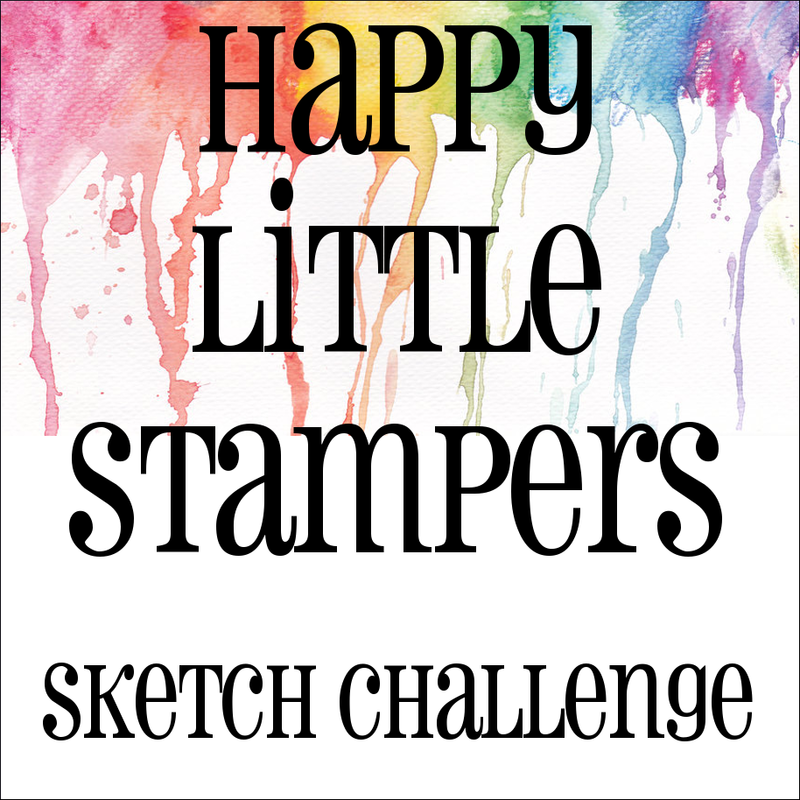 Please visit the Happy Little Stampers Sketch Challenge blog for more ideas and inspiration for this sketch. I hope you will play along. You have the entire month of September. 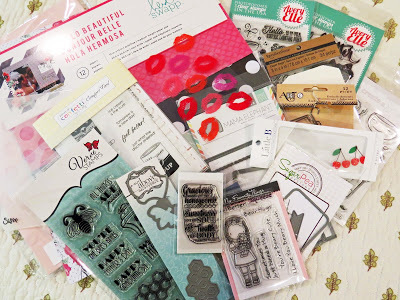 Well, the summer has just flown by and it is now the end of August--time for our monthly 12 Kits of Occasions post. This month, our hostess is Michele of I Card Everyone, and she sent us this huge kit filled with all sorts of fun goodies. I did not have as much time as I would have liked to play with this awesome kit, but I was able to quickly make three cards without making much of a dent in my supplies. I am looking forward to CASEing some of my fellow 12 Kit-er's with my vast supply of left overs. Please head over to our 12 Kits of Occasions blog to see a list of team members along with links to their blogs. 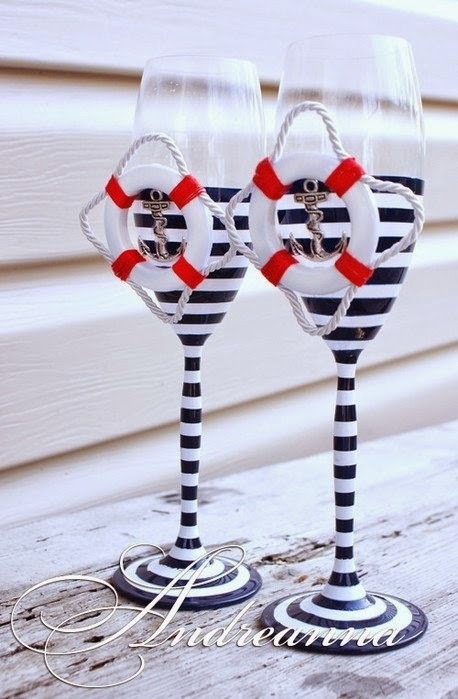 You can also see who our lucky Guest Designer is this month. Hello friends. 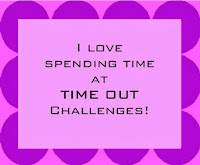 I have some big news to share today--I am joining the Time Out challenge team. I am so very excited to be crafting along side the talented team at Time Out. The current challenge at Time Out #38 is a home sweet home challenge with this photo as our inspiration. Inspired by the stripes on the glasses, I masked off a square on the front of my card and stamped WMS Mini Striped Background within the square. As a nod to the nautical theme, I adhered two die cut sailboats over my striped background. I finished the card off with one of my favorite WMS sentiments from Ocean Bound. I hope you will join me in playing along with Time Out #38. 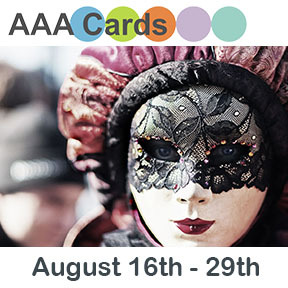 Head on over for further inspiration and to link up your own card. 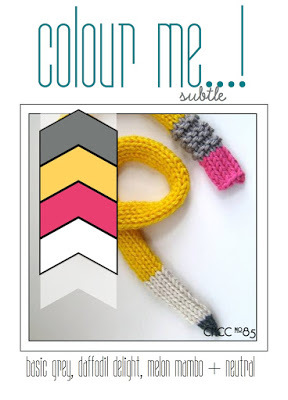 If you are looking for my ColourQ post with exciting news, please click here. If you are looking for my PTI August Blog Hop card, please click here. Hello and happy Tuesday. It's time for another challenge at CASology. 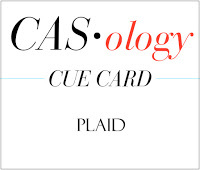 Our cue word this week is PLAID. I love plaid on cards. (On clothes, not so much) I broke out my PTI plaid builders set and several WPlus9 ink pads and stamped a plaid pattern on a piece of card stock 4 1/4 by 5 1/2. Then, I had to decide what to do with my plaid panel. One rule of CAS design is to try to keep your stamped images to 1/3 of the card. In my opinion, texture, dimension and small embellishments can go a long way towards adding interest to the 2/3 of the card left white--without making it too busy or detracting from the main image. I decided to use a piece of my plaid stamped piece as a border and impressed my top panel with a plaid impression plate. Now, it's your turn. How are you inspired by PLAID? I hope you play along this week. Please remember to keep it Clean and Simple. If you are looking for my CASology post, please click here. 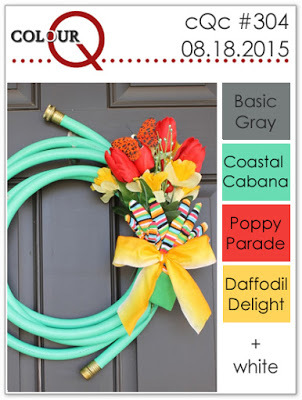 If you are looking for my ColourQ post with exciting news, please click here. Today, I am playing along with the Papertrey August Blog Hop. We were given this photo as inspiration. Although it is still summer here in San Diego and will feel like summer basically the rest of the year, this picture made me think of fall. Warm fall colors and fuzzy sweaters in particular. I pulled out an older fall set, Autumn Acorns, and stamped a panel of leaves inspired by the colors in the photo. After my stamping was done, I die cut the word 'happy' and then stacked it up and inlaid the stack back into my stamped panel. I stamped 'anniversary' from Everyday Happiness and I was done. Both my siblings have anniversaries around Labor Day weekend, so this card will go off to one of them in a week of so. If you are looking for my CASology post, please click here. 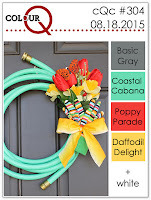 If you are looking for my PTI Blog Hop post, please click here. I have some very exciting news, although if you saw this post at ColourQ announcing the winners of their 300th challenge, this news will not be a surprise to you. My news??? I have been invited to join the ColourQ design team. Here is a picture of my winning card. ColourQ is one of my very favorite challenges to play in--Arielle always has such amazing photos and beautiful color combinations to inspire us. I am very happy to be joining this talented group of crafters. 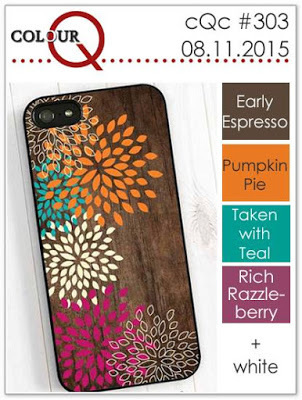 Take a look at this week's colors--I have been loving my WPlus9 and Hero Arts inks lately, so I used these colors for my card this week: HA Passion Flower and WPlus9 Ocean Drive, Pumpkin Spice, and Falling Star. Feel free to use whatever brand of inks you have--just try to match the colors as best as you can. I pulled out a set that I had given up on--Avery Elle Balloons--because I could never get a good impression from those balloons. I decided to try stamping with my new Misti--and I was able to stamp each balloon several times in order to finally get really solid balloons. 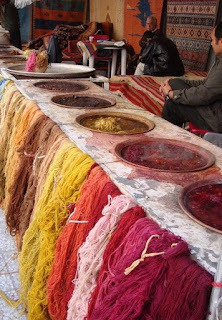 Please head over to the ColourQ blog to see more inspiration from the other members of the ColourQ Royal Court design team. 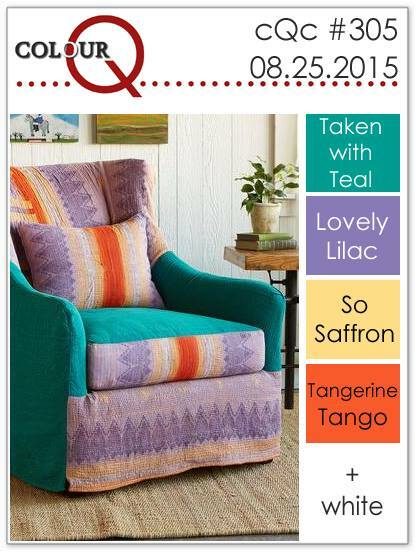 I hope that you will play along at ColourQ this week. I was admiring Geri's stunning card that was a winner at CAS(E) this Sketch last week, and it dawned on me that I could try to make something similar with my Misti. I have long been frustrated by PTI Square Prints because I find it impossible to line up or stamp straight. Well, I still need some practice, but here is what I was able to do right off the bat. I would love to hear your best tips on using the Misti or links to your favorite videos. I used colors from this week's ColourMe #85. I've been a bit under the weather this week--even too sick to craft one day. Fortunately, I am completely better and I am posting a few projects that I have done over the past several days. First up is a card using a brand new Hero Arts set that I just ordered called Color Layering Hibiscus, and I used a technique I saw in this video by Jennifer McGuire, where she shows hot to achieve a water color effect using a Copic Blending pen. 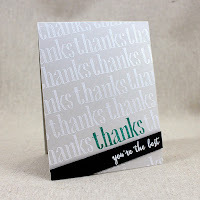 I am linking this card up at Simply Create Too#92 where their challenge is Anything Goes. I recently realized that I have been living under a rock inside a cave. Yes, that is true. I just discovered Kathy's blog--The Daily Marker and I think I must be the last person on earth who did not know about it. 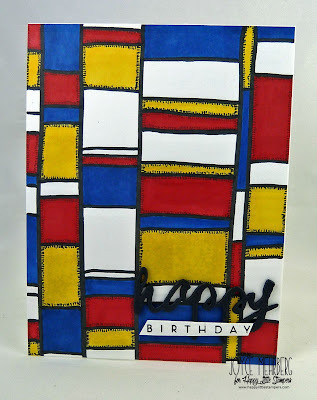 I learned a fun technique about drawing lines, and while I have missed the chance to link up to her Pop up challenge, I did make a card using this week's Freshly Made Sketch #200 and I am linking up there to help them celebrate their 200th challenge--Yay FMS!! Here's to the next 200. 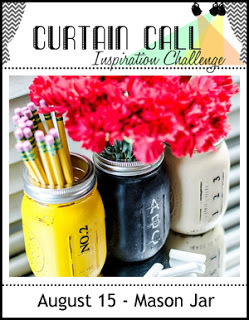 My last card is inspired by the Mason Jar challenge at Curtain Call. I am going to do my best to make my way around blogland this weekend to catch up on what I have missed the last few days. So I'll probably see you around. I've got two birthday cards to share today. My first card is inspired by the Make it Monday #221: Masking Sentiment technique and uses the colors from ColourQ #304. I stamped a birthday sentiment from PTI Stylish Sentiments: Birthday and then masked it while I stamped a background pattern all over the card using images from PTI Friends Till the End. My inks were Hero Arts Charcoal and WPlus9 Gala Red, Lake House and Hayride. 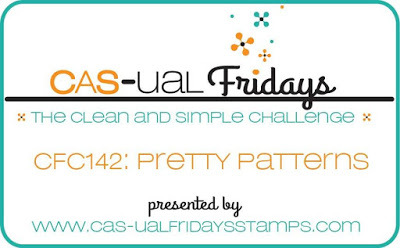 I am also linking this card up at AAA #36 Maskerade and Casual Fridays #142 Pretty Patterns. I came across a really cute stamp set (Impression Obsession Birthday Cakes) that was buried deep in my stash, and decided to pull it out and make a quick CAS birthday card. I added a bit of color with Prisma Color pencils and Stickles. There are so many cute images in this set that I want to use in the future. I am going to keep this set in a more convenient location. 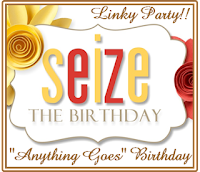 I am entering this card at Simply Create Too #92 Anything Goes and Seize the Birthday, no toppings. Hello and happy Tuesday. It's time for another challenge at CASology. Our cue word this week is NUMBER. My thoughts went to birthdays and candles and counting the candles...you get the drift. I stamped a bunch of candles from PTI Wishes Come True and then (carefully) arranged them randomly. 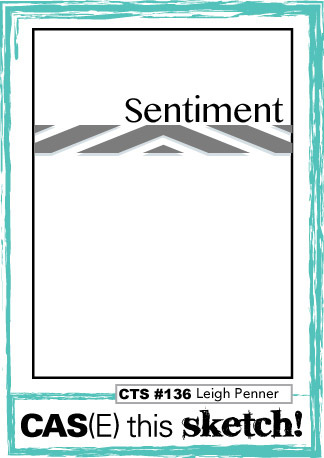 To preserve white space, I stamped my sentiment on a banner that I adhered over my candles. Before attaching anything to my card front, I used the PTI Numbers impression plate to add some texture and interest to my card front. Now, it's your turn. How are you inspired by NUMBER? I hope you play along this week. Please remember to keep it Clean and Simple. Hello. I have two cards for today. My first card uses the sketch at CAS(E) this Sketch #136 and the colors from ColourQ #303. I stamped some of the fun camping images from PTI Petite Places: Happy Camper in a row across the top of my card. Yes, that is all I did. 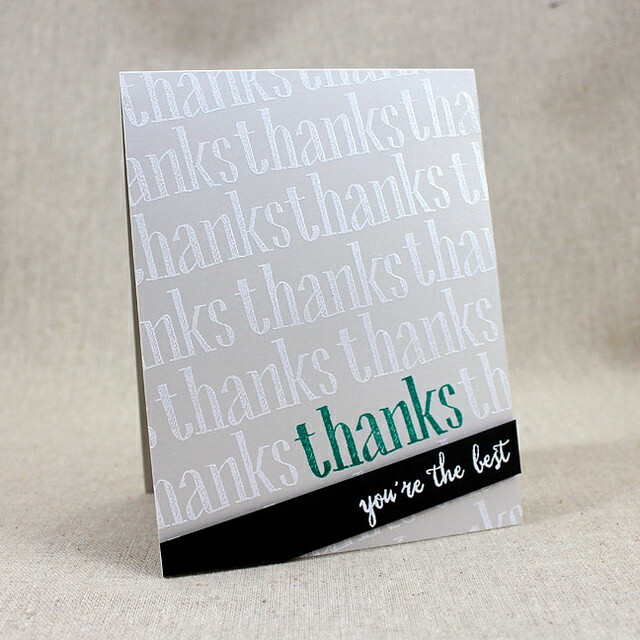 I was inspired by this card by Lizzie during the PTI August release festivities. I used Wow Silver Pearl embossing powder to repeatedly emboss the word happy from Stylish Sentiments: Birthday on to a Soft Stone card base. I think this card will go into my masculine birthday stash. 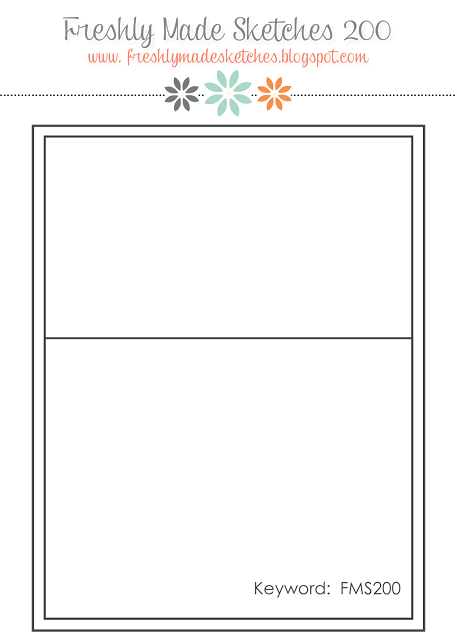 I am entering this card at the PTI Create Along With Us challenge.